She stood on the steps, watching the boy talk to the dogs, which leaped around him as though encouraging him to come and play. Sweet kid, he was. Intelligent too, just not...well, all there. His uncle was a "tough guy," but a good sort, she thought. Nice to his poor relative who was so obviously a couple of fries short of reality. As Minerva MacDonald had been told, Harry's parents were killed in a car crash when he was three years old. Harry had been left with an odd-shaped scar on his forehead and only half of his mind. That half was stuck in a fantasy world, as a way of coping from the brutal reality of his parent's death before his eyes at such a young age. Harry always talked about a school for wizards, how he was special because he was the "boy that lived," about his wizard friends Ron and Hermione. The dangerous part of these fantasies, the crazy statements that had led his aunt and uncle to take him out of school for good, had started back on his eleventh birthday, when Harry saw an owl flying overhead and started talking about how it was carrying a letter for him. He tried to run away from home, screaming about owls, and had fallen into a neighbour's pool. 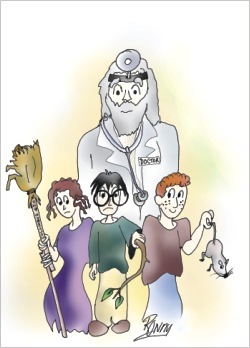 His aunt and uncle had been forced to bring him here to Hogmore's Institute, where Dr. Bumbledore had examined him. Pronounced incurable though harmless to all but himself, Harry Potter was given a permanent home at the Institute. Yes, Minerva thought to herself, folding her arms across her chest, Harry was happy here in a way he had never been at home. Not that his relatives liked the idea of Harry locked away in a mental institution. Every summer they tried bringing him home for a few weeks. Every time he caused so much trouble that they had to bring him back, shame-faced that they could not control him. Twice he'd run away (once found by an old lady that lived nearby after two whole days of frantic searching had passed), once he'd caused such a fuss while company was in the house that they simply could not stand to keep him there any longer. But, oddly compared to the majority of the patients, Harry enjoyed living here. He'd made friends with the two recently acquired dogs, one of whom had given him a bit of a scare by being a bit too enthusiastic at their first meeting. But they'd made it up and were now the best of friends, always together. He did not bear much fondness for the rat that ran loose in the halls, however. And the cat hadn't been his favourite playmate, yet he'd never mistreated her. No, Harry mostly just stuck to Remy and Siry, as he called them. Harry spent a lot of time outside, playing with an old broomstick, muttering something about a "golden something." He'd go through the gardens carrying the broom until his eye caught something shiny, and then would dive for it, holding the whatever-it-was like it was a treasure. Once last year, during a slight rainstorm, he'd gone out into the garden, not knowing that another patient was also out there, the gentle Mexican boy named Cedrico. The kid also liked shiny things, and when they both saw a golden penny, they grabbed for it, knocked heads...and well, Harry was in the hospital for quite some time, jabbering about how Cedrico had been killed by the Dark Lord. While Harry was in the hospital, Cedrico was transferred to a hospital in America. That didn't help Harry's impression that Cedrico had been killed and that it was somehow his fault. Those had been dark times. Harry spent a lot of time crying in a corner of the garden, until his relatives came to take him home for the summer -- "one more trial" they said. But now Harry was back here, and loving it by all accounts. Minerva walked down the few remaining steps. "Harry!" she called. "Time to come in, look, the sun's going down." Harry looked up at her with blank eyes, just a hint of recognition in them. "Okay, Professor," he said. Vaguely Minerva wondered why he always called her Professor, then figured it must be part of his school fantasy. Harry patted the two dogs on their heads and made his way over to the nurse. "The darkness is coming, you know," he said conversationally. "Look, the Dark Mark in the sky!" He pointed to the odd shape of the dark cloud against the pink and gold. "That will call the Death Eaters! I wonder if Snape will go this time?" He turned back and looked up at her earnestly. "Is Snape really on the side of the good?" he asked. She didn't know who he was talking about, but tried to reassure anyway. "Yes, I'm certain of it, Harry. Now, it's time to come in." "Professor, I don't quite understand the homework for today. Maybe you could help me and Ron with it later?" Minerva looked down at him suddenly, filled with pity in a way that had become so rare with the years of working here. God, the boy was so sweet and innocent that it was practically a crime to disturb his childish fantasy. "It's okay, Harry, you're a bright boy, you'll get it if you keep working on it," she told him. She took hold of his hand, and walked with him up the steps into the house. Just inside the house, one of the older patients, a big man who was gentle but unaware of his own strength, fond of playing in the gardens, waved at Harry, who called out "Hey, Hagrid!" and waved back. In the dining hall, Harry broke away from her and ran over to his table, chattering excitedly to Randal and Hera, his friends and roommates. "I can't believe she took three points from Gryffindor, it's not like I did anything really bad!" Harry chattered at them as his friends stopped talking to listen to him. "And did you hear what that idiot Malfoy said about the team?" Minerva smiled. Harry may live in his own world, she thought, but whatever it is, it's an interesting place. Dr. Bumbledore walked into the hall, smiling benignly at the assembled group. The good doctor was too overly dramatic at times, Minerva thought. The patients could get strange ideas. Especially Harry, who incorporated everything into his own world. A pixie-faced young man served Harry, who was muttering to Hera about the mis-treatment of house-elves. It sounded like he was holding an argument with her, both of them talking about completely different things. Dinner halfway through, Harry spent some time looking across the room, staring at his "crush," Cho Lee, an Asian girl who had a problem with split personalities. Minerva sighed. Poor Harry. He could not possibly understand the delicate balance of emotional relationships, and, with Cho's problems added to the mix, was doomed to unrequited love, if he insisted on having her. One of the youngest in the room, Jenny, a girl who had started a fire, trying to kill herself because her self-esteem was through the basement, was staring at Harry in her own attempt at unrequited love. Harry occasionally spoke to her, but generally hardly knew she existed. Poor all of them. No one here could be held responsible for all the pain they made into their worlds. Minerva was just happy that Harry Potter's world was more fun than most. My mom was only a teenager when I was born. She was yet to finish her HSC, and by the time I'd learnt to stand straight, she was taking me to the college with her. That way, I started 'babe watching' at quite an early age, but couldn't exactly exploit the privilege, partly because my mom was always there to keep an eye on me, but mainly because the diapers I were obliged to wear in those days made me look rather uncool. Ah, well. Philandery was never easy. As a kid, I'd always found in my mom a friend I loved to pick a fight with. She tried to be stern, but in the end of the day, she always ended up being the more impish of the two. To start with, my mom had a very poor memory. When I was born she named me Tawsif, but by the time I was ten, she had already forgotten that. She started thinking she'd named me either Gadha or Ram ( short cut for Ramchchagol), but couldn't decide which one. So, she started calling me with both the names; Gadha in private and Ram in front of the others. Except for the memory thing, however, everything else was just perfect about my mom. Especially, she had this prodigal talent of hurling combs at any moving body with a perfect accuracy. Since the 'body', just referred to, usually happened to be mine, I had to stay alert all the times. It's not that mom threw combs at me for sheer fun. It's just that I kept giving her reasons to do so, one after another. As a kid, I used to suffer from the illusion that I was a mutant. So, I often tried to bring out my adamantium claws to help me eat my noodles, or fry a dozen or two mosquitoes with my optic blast. In vain, I'd come to realize that I wasn't a mutant at first place. Actually, I lived inside the Matrix, and I was the ONE. Eventually, I'd try to fly like Neo, and end up landing on the dining table, smashing an entire set of wineglasses. Mom would come running all the way from her bed room, only to find me sitting on her dining table with half-a-dozen glasses scattered all around, and a broad, philanthropic grin on my face. She would turn morbid, and even before I could explain, I'd find combs rushing at me at 150 km/hr. I always tried to behave while mom was in the kitchen. She might be working with the knives, you know. Mom was a great prankster, as well. We never had domestic help in our place, and Dad was always late. So, I had to spend the evenings alone with mom. She would often just lie down on the bed and pretend that she was dead. I'd scream, shout and try to wake her up in every possible way. (I was only seven, in those days.) But she wouldn't move a bit. And just when I'd be convinced that she was really dead and start crying or something, mom would suddenly open her eyes and burst out giggling. But she always gave me ice-creams after she'd finished giggling. So I never complained. However, as the days merged into months and the months into years, our relationship started to change. She became over-protective, and started beefing about anything and everything, starting from my untidy room, to the number of girls who called me. By the time I was in the mid-teens she turned into the villain of my life. Then one day, she just crossed the line. I was fifteen, at that time. I had a huge crash on a school hottie, and it was her birthday. So, I bought her a rather mushy card from the Hallmarks. Mom saw it on my desk, and accidentally read it. Later on, when I was leaving for my school, all duded up in hair gel and colognes, mom asked me about the card. She said that I was being foolish again, and that I'd get myself hurt. I got cranky, and spoke really rudely with her. Mom had tears in her eyes when I left the house. By the time I reached school, I'd forgotten the whole incident. Hormones had taken over. I bought roses from a nearby shop, and entered the school, lost in daydreams. The girl turned me down. As I was returning home that day, I felt dizzy with shame. Not because a girl had turned me down, but because I'd insulted my mom for someone who didn't even know my full name. With the roses held in my hands, I headed straight for home. When mom opened the door, I gave her the flowers. Even before I could spell out the words (I AM SORRY MOM), I found myself lost in a warm hug. Mom had forgiven me once again. She knew what happened at school, and she wasn't going to laugh at me like everyone else. She was holding me up, like she'd always done. Ever since then, I never misunderstood my mom. She still throws combs at me. She still keeps beefing about untidy rooms. But deep inside, I know that whatever she does, she does it for my own good. My mom is the nicest lady God had ever made. Otherwise, she couldn't have tolerated me for the past nineteen years.